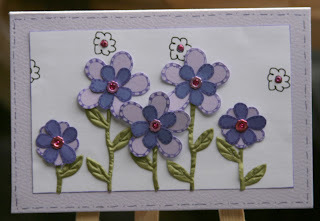 Here is my card using a freebie paper from the Funky Fairy Inspirations Blog with Funky Fairy 'Doodles for Daniel' flower stamps: I used 3 different ones layered over each other. Jozza is giving blog candy to mark her first Funky Fairy challenge and you have until Sunday 6th April to create something and leave a link for a chance to win so click here for the challenge blog. 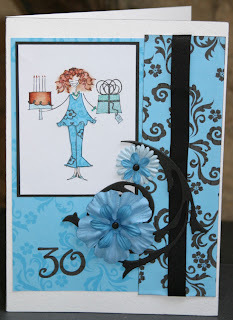 Used this week's Ismaki challenge sketch to make a card for my step-daughter's 30th. 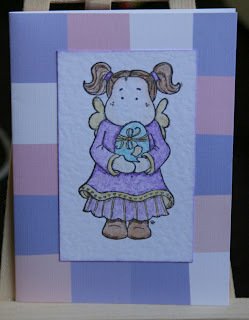 I was struggling for ideas until I saw the sketch and then it all seemed to come together and I am really pleased with how the little outfit of the reduced version of the backing paper brings the colours together. Used: Funky Fairy 'blue' collection (2 papers) and printed the 30 on, Pink Pettcoat Lilli image painted with H2Os and 'dressed' with reduced-size Funky Fairy paper overprinted with the image, Tim Holtz' grungeboard painted with black acrylic, Prima's, MM brads and ribbon from my stash. First use of grungeboard and I love it: The flourish painted black looks and feels like leather. It's weird material but great to use. Another kind of challenge ! Delivered it today and got a good response so I'm happy. In fact, it was nice to do something a bit unusual. 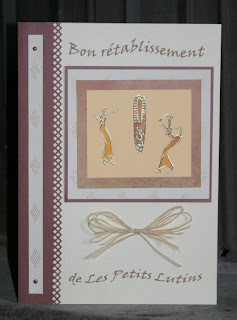 Used: 2 x A4 cream hammered card held together with a spine of brown card punched with Fiskars diamond border punch; Gold diamond textured paper from The Papermill Shop; other layers and African design peel-offs of unknown origin from my stash & Making Memories mini brads. Coloured the images with H2Os and made a bow from raffia. Text printed from computer. 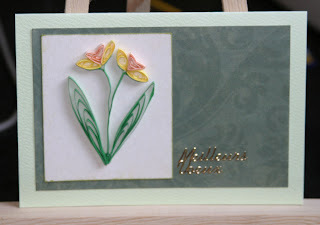 Lined the card with 2 x A4 matching cream hammered paper. One of the good things about being on the design team is getting to do the challenges in advance as after 2 days at the Melgven expo I am exhausted. 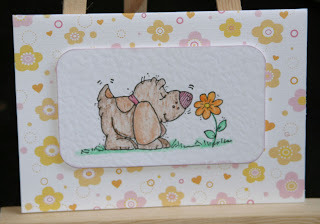 These cards are therefore not only ones I made earlier but they were sold yesterday too! The Funky Fairy Challenge this week is to 'Bling' your cards so why not join in and have lots of bling fun? I made these cards using papers from the Funky Fairy 'Blue' collection and one freebie paper which can be found on the FF Inspirations blog. The 3D embellishments are from a set bought at Lakeland Ltd over a year ago and they have serious bling. Have to say I had a great 2 days at the Melgven (Finistére, France) expo and it was wonderful to see such a great range of art and talent. Will definitely be back there next year. 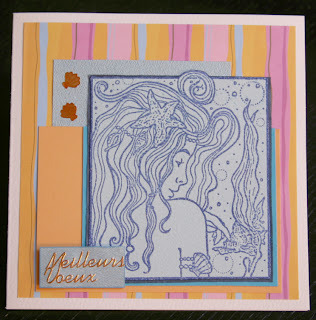 The challenge on Sunday Stamper this week is "I'm A Laydeeee": To make something using a stamp with a female image. 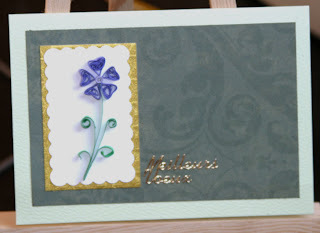 This is a super quick card but I like it all the more for that! I'm about to do a 2-day demo at an art exhibition Sunday and Monday and need to do displays as well as lots of cards and to sort out what to take with me so every minute counts at the moment! I'm also putting together a few cards for the expo prize draw so this may well go in there as it is an 'any occasion' card. 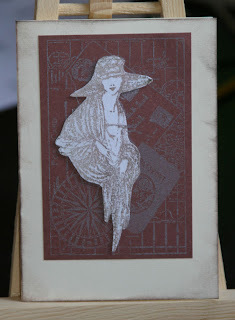 Inkadinkadoo image stamped on brown with white ink, on white with brown ink, cut and layered the lady. 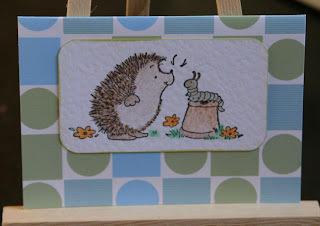 Mounted on a cream card blank with brown ink smudged round edges. OK...not so long ago we had our scissors confiscated, life was tough! ...now you need them for sure! This weeks challenge is to 'Cut up Your Cards' ... literally!!! *. *Anyway you want to, just so long as it's been cut! Oh but...please be careful with those scissors in all the excitement! 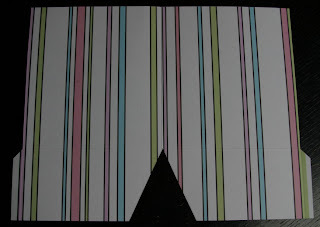 ^.^ Here's my take on the challenge: A folder card ready to send some PIF (see below) goodies off in. Started with an A4 piece of card printed both sides with designs from Funky Fairy's 'Funky Flowers' collection and cut and scored it to this: Then I folded in the tabs and flap to create the inside pockets and used my eyelet punch to create holes for the ribbon to pass through: I then decorated the front with a Funky Fairy Pinkie Pops Square printed on lilac card and mounted a flower pot arrangement using one of the Funky Fairy Doodles for Daniel stamps. I coloured this one with my pearly paints and a good dose of my fave glitter glue. 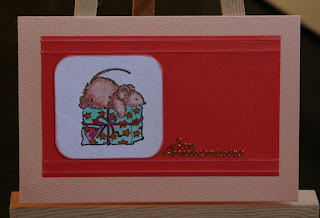 I got the idea for the folder from Jo King who has lots of lovely examples on her blog and there is a tutorial for them on Katharina's blog. The rest of the team's designs can be seen on their blogs and on the Challenge blog here. 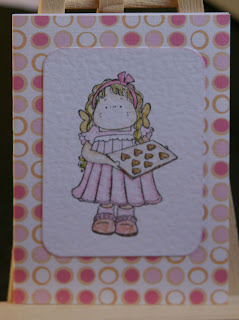 There's also lots of great freebie papers to download on the Funky Fairy Inspirations blog here. There's an interesting sketch for Ismaki challenge 10 which I've followed for this 30th card for my nephew. There's a whole paper-weaving thing going on in the middle there which just happened and rather took me by surprise but I am quite happy with. It was weird sticking down lots of layers together though! I used the same stamp (Inkadinkado) for a black, white & silver card few weeks ago. 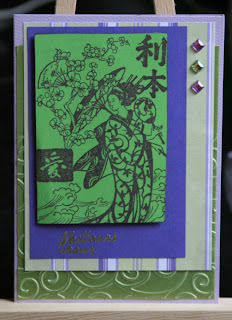 Decided I'd go brighter this time for the Sunday Stampers Challenge - Oriental. Had these green & purple pieces sitting on my table a while as they are so fresh and go so well together although you might not think so from the photo! Here's my first ever Magnolia with a stamped image courtesy of Jo's PIF to me (see below), which I water-coloured with my pearly paints. 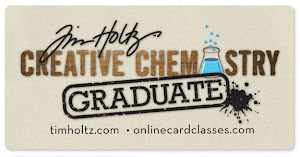 I have made the card following the Cartes Maniak sketch 43, mirrored and flipped and with the extra fold-back on the card. Look at the great PIF (Pass It Forward) I received from Jo King. Thank you Jo! This was a Sugar Nellie & Magnolia - free zone but all that now changes! 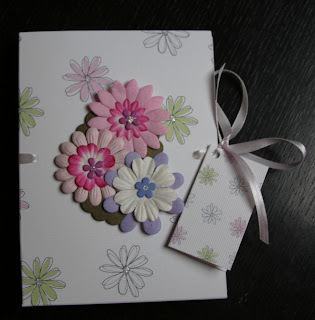 This beautiful folder from Jo features a Sugar Nellie and inside were some stamped images including Magnolias, one of which I have already used so I'll show that in a minute. In true PIF style then.... The first 3 people to leave a comment will receive PIF goodies from me. Open to anyone on this little planet we call home! 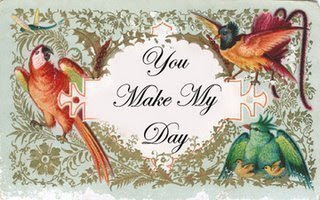 You agree in receiving PIF to then PIF on your blog and send goodies to 3 more people. Great fun ! The stamp (by Stampin up) is very versatile because it comes with a separate basket and things to go in it so I have Christmas, crafting, and other goodies to go in the basket but they are a nightmare to line up as they are not clear stamps and also I like to get some 3D feel between the things in the basket and the things hanging over the basket but they are on the same stamp. So, this was a fiddly stamping on different scraps of Funky Fairy papers and a bit of brown paper and layering them, cutting little slots for the eggs to fit in etc. Image layered on scrap of green card and FF 'Meadow' paper. Needless to say, stamps are now back in the drawer! Next decided to do something that is just for me, as it says in the rhyme: I've just started a course to improve my french so I went wild on my very boring blue plastic folder. I had a nice afternoon playing with this without really knowing how it was going to turn out. 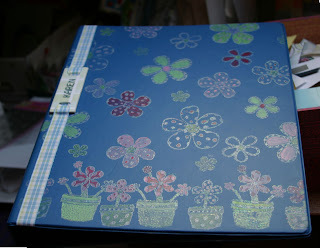 I used Brilliance Moonlight White with the FF flower stamps: Did the back first and heat set that and, as that didn't smudge and the folder didn't melt, I was brave and did the front and embossed it as well. Then painted with acrylics and added a papier maché slider covered with squared paper from FF 'Cool co-ordinates' and my name in coloured peel-offs on DCWV adhesive ribbon. 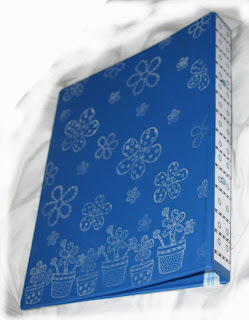 Made the spine match my box files with FF 'Do ya Doodle' paper. Hope it will be robust enough to last the course. Not sure if I over did the painting but I think it is better than the boring file I started with. I don't normally make posts like this but Meayla has been busy in the background setting up a charity in memory of her daughter Briony who sadly lost her fight against cancer on 19th march last year when she was just 3 years old. The aim of the charity is to bring a smile to the face of a newly diagnosed child to buy them a gift that they really want, showing people care and brightening their time a little. However, to qualify for full charity status you have to be running for a year and prove that you can get at least £5000 in donations etc. Once you have full charity status it's then easier to get donations and other support but the first year is a hurdle to get to that £5000 threshold. Briony's Gift will officially launch on 19th March, 1st anniversary of Briony's passing. The school where Briony went to nursery are going to hold a non uniform day and donating the money collected to 'Briony's Gift' and Meayla will be having a stall at the school selling hand crafted items to raise funds. Briony's Gift needs to raise at least a few hundred ££ to get off the ground and help their first child. So if anyone can donate any handcrafted items to be sold at the school (yes, I know that's only 10 days away) it will be much appreciated by Meayla and those children and their families receiving the support. My neice goes in to hospital for yet another round of chemo tomorrow so I do know how much the work of charities like this mean to diagnosed children and their families. My email link is in my profile if you feel you can help. This week's sketch on Ismaki involves lots of layering with the option of 'pets'. Mine is fairly true to the sketch: Although it has sunk down the card a little, all the layers are there. Not sure if petting a fish counts for the option? I don't know the make of the stamp as it came to me unmounted but I used Royal Blue Colour box ink and embossed with holographic powder, layered on dark blue silk paper, card in blues and orange and papermania patterned paper. I coloured the sentiment and Anita's peel-off shells with orange permanent pen to help them blend in. The Sunday Stampers Challenge this week has been to create something with a man on. This is a very under-used stamp for me so last minute quick card by giving him a dust off, stamping with distressing ink and layering up with a peel-off sentiment coloured with permanent pens. 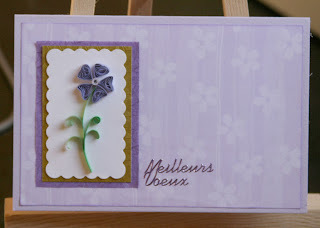 Not sure who the recipient will be, which is why I've opted for 'Meilleurs Voeux' (best wishes) as the sentiment, but next time my husband wants a last minute card for one of his chums in the cycling club I'm ready! Made this card for a male friend whose birthday is Sunday. We first met many years ago in Japan, hence the theme, and have stayed good friends ever since. Had Envys challenge of using black, white & one other colour in mind when making it. 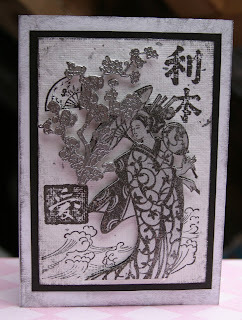 It is an Inkadinkadoo stamp which I have used 3 times with black ink; first just heat set on white heavily textured card with silver flecks, secondly on slightly textured silver card which I embossed with clear powder and cut out the woman from and thirdly on another silver which was also embossed in silver and I cut out the cherry blossom from. Distressed the white card with black ink, layered the images up, mounted them on black card and then a white card blank, also distressed with black ink. It is reminiscent of B&W images that we saw and bought in Japan and I think I've managed a card suitable for a male from a feminine image. Hope he likes it. 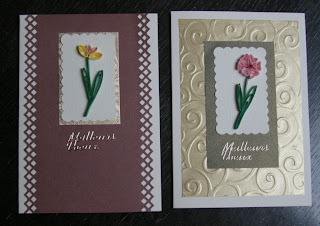 Had a play with some paper flowers and dug out some flower soft for the pink one. Thought I'd try and convince myself that it can look good as I haven't liked previous attempts. 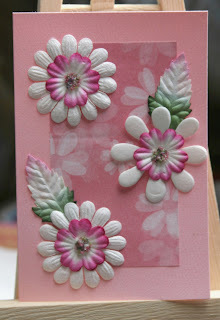 This time blobbed (tec term) glue in the middle of the flowers, pressed the flower soft in to them, shook off excess and then used 3D glaze on top and worked it in with a bit of spare card to hold it in place: Actually like it! 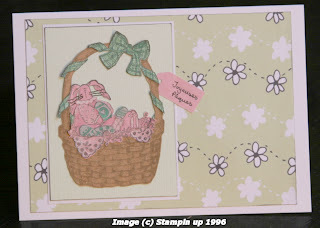 Pink card using Papermania paper; Lilac card using Papermania gems with Funky Fairy 'Do ya Doodle' paper with centre of flowers coloured with gel pen. 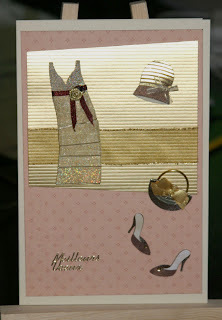 As Meayla's Funky Fairy challenge was to "go mad" with ribbon & eyelets I didn't feel I had done it justice with the 'snail' card. Today I had a play with some ribbon shaped as leaves plus my Funky Fairy flower stamps and used eyelets as the flower centres. 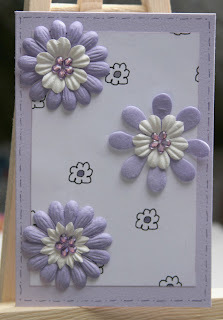 I also put tiny eyelets through the flowers on the backing paper which is from FF 'Do ya Doodle'. The tiny eyelets drove me mad falling out, hence the glitter glue holding them, but quite like the end result. I have been given this gorgeous award by Gill (Gillyflower). She's been having a tough time of it lately so if I've brightened her day at all I'm more than happy. Tough bit: Choosing who to pass this on to. I'm going for the bloggers I share with most and give me such fun as well as great inspiration: Each of the Funky Fairy Team: Shaz, Meayla, Lulu, Jozza, Hannah & Lydia. It's all about the eyelet! 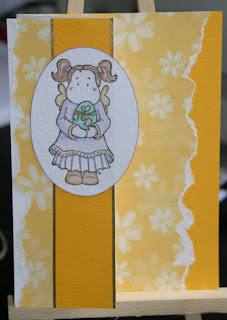 The Funky Fairy challenge this week is to go mad with eyelets and ribbon. I haven't done that (yet) but HAD to use this eyelet: It arrived this morning with some other bits as an extra in a craft order. What perfect timing! 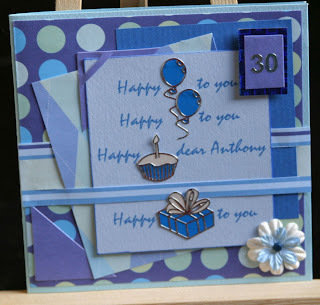 My husband has requested a card with a snail on for his son's 32nd birthday ! They are all really competitive and it's as a reminder that this son came last out of a cycle race between dad and 2 oldest sons up Alpe D'Huez so they nicknamed him 'escargot'. Other son came first and was called the chicken (???) ! Doing it at all is amazing ! Used: Funky Fairy Cool Co-ordinates paper (turned square paper to make diagonals), DCWV 'Boy' adhesive ribbon, papermania sticker sentiment, unknown source of snail eyelet, image from french children's colouring site (must get addy from my son) coloured with pearly paints and shell covered with 3D glaze. I was a senior teacher in a secondary school in UK. Young, free and single. Very active and travelling lots. I can't believe how much life has changed since then! 2. WHAT WERE YOU DOING 1 YEAR AGO? Getting used to life living in France with my husband and son, spending the average day renovating the house and trying to grow our own veg. I very rarely eat between meals (halo glowing) but can't beat a nice bit of hot buttered toast, couple of biscuits, piece of cake, chocolate or, on the beach, ice cream ! Buy a big house in the area where we live with a large, fully-kitted-out craft room. Make sure family and close friends were financially secure and enable them to visit when they liked: We don't see them as often as we'd like since we moved to France. Travel regularly especailly to places I've not been yet. Do anything money could do to cure my neice of Leukaemia and help the other kids treated by Birmingham Children's hospital. Visiting family and friends, and I love having them visit us. Seeing seeds that I've sown starting to grow - Amazing ! Being snuggled with my husband and/or son watching a LOL film or programme. Tight dresses that show off all your curves - I need to choose which ones to show off these days! High stillettos - My ankles can't take them any more. Leggings - for the same reason as the dresses! 7. NAME YOUR 5 FAVOURITE TOYS! Lego - My son never had a choice in having lots of it. My addiction started in childhood. "Mitternachtsparty": A ravensburger game I bought after playing it in Germany 12 years ago: Still love it esp when the ghost moves round and we all go "Whooooooo" in true ghost style! 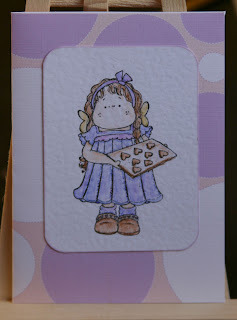 I created this card for a friend's birthday and used the sketch from this week's Cartes Maniak challenge. Used my Fiskars diamond border punch and a Hampton Art stamp with Frayed Burlap Distressed ink and Whispers pads and finished with a peel-off. When I finished punching the brown card and moved the punch, I thought the bits looked so much like choc chips I just had to do a cupcake card as well. 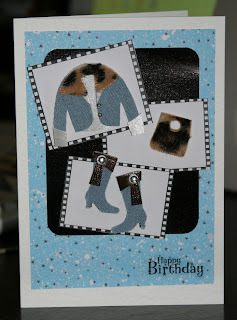 Just hand drew the parts on scraps and layered up on a Papermania card and another scrap of K&Co paper. Will add a sentiment later but got to take son roller-skating now!